Three women relaxing at an indoor pool Black Bear Resort Port McNeill. 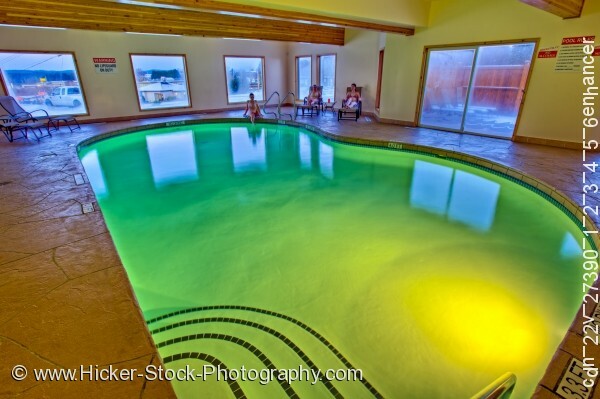 This stock photo shows three women relaxing in a large lighted indoor pool. The pool is a soft, abstract shape of the letter B. The lighted pool reflects a calming green. The foreground shows four steps entering into the pool. At the background one woman is sitting at the pool's edge. The other two women are relaxing in full length lounge chairs. At the back left of the photo there are two empty full length lounge chairs. The pool is surrounded by a brown granite textured stone. The walls are painted a light tan with several windows surrounding on two walls and they are trimmed in wood. The ceiling has several wood beams expanding left to right of the photo. Three women relaxing by the pool at the Black Bear Resort & Spa, Port McNeill, Northern Vancouver Island, Vancouver Island, British Columbia, Canada.